Interstate Falls is one of three large waterfalls located on the Montreal River, between the borders of Wisconsin and Michigan’s Upper Peninsula. 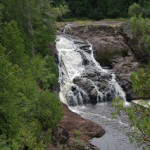 Like Saxon Falls and Superior Falls, the best views of this waterfall come from the Wisconsin side. 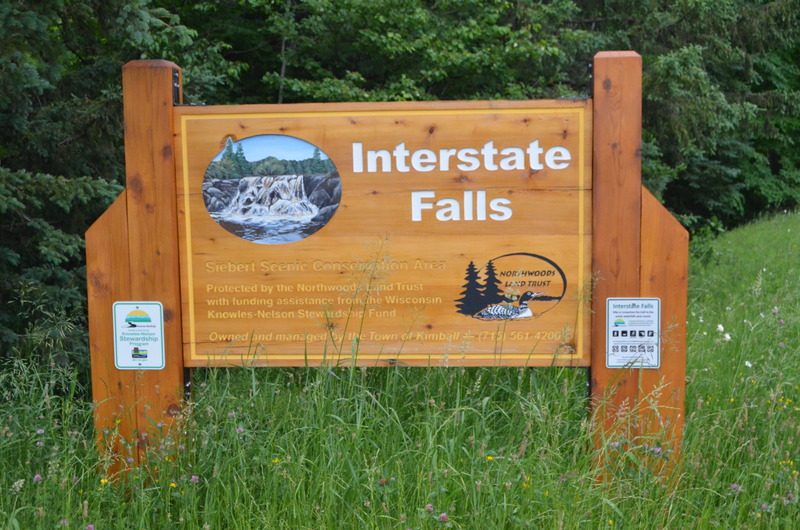 The property surrounding Interstate Falls was recently purchased by the Northwoods Land Trust, ensuring public access to the site and leading to improvements in signage and trails. 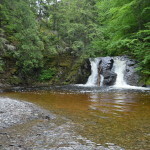 We had visited this waterfall in 2009 (shown above), navigating our way with minimal signage and faintly developed trails. 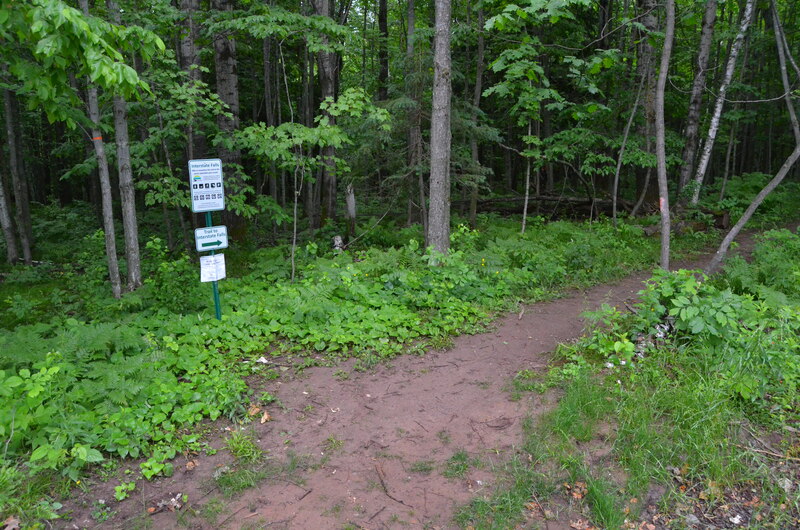 A return trip in June 2017 found visible signs out on US-2 and at the parking lot/trailhead area. A short hike (less than 1/2 mile) on a well-maintained trail brings visitors to a few different vantage points of As an added bonus, the water flow was much better than during our previous visit. 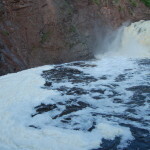 Interstate Falls is formed as the Montreal River makes a 20 foot drop over a slab of volcanic basalt rock. 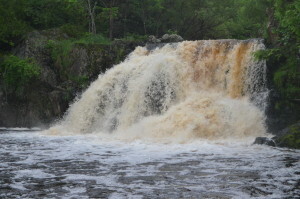 At low water times the waterfall mainly flows over the middle section of rock, and more of the rock is visible at low river levels. 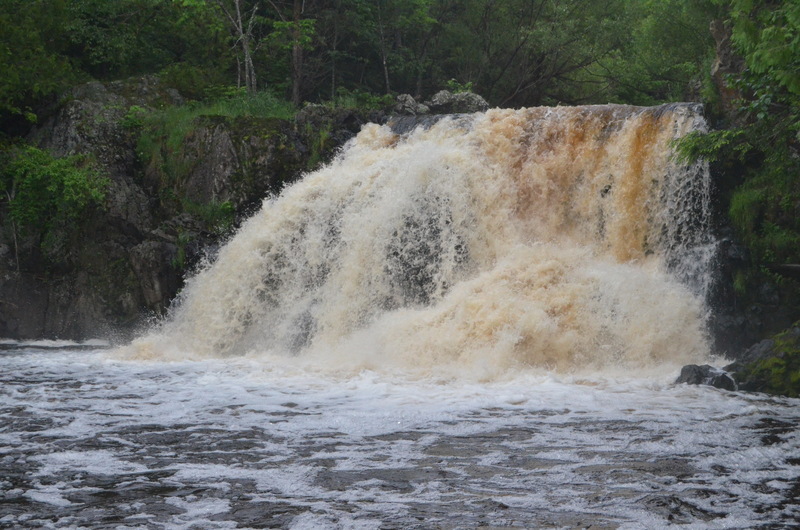 When water flow is high as it was on our 2017 visit, the rock is not visible and the drop becomes a thundering rush of water. 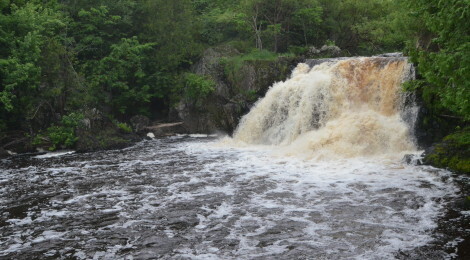 Views of Interstate Falls from the Michigan side of the river are not possible as the land is owned by private homeowners. 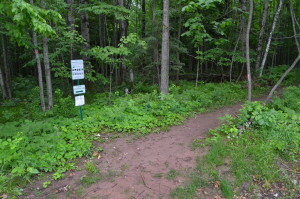 To reach the falls, head west on US-2 from Ironwood, passing into Wisconsin and turning right onto Center Dr. at the wooden sign shown below. There is a small waterfall upstream from Interstate Falls that is called Peterson Falls. 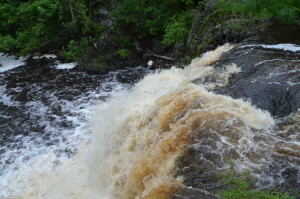 It lies on private property, and for years there had been confusion over which name was correct for each drop. 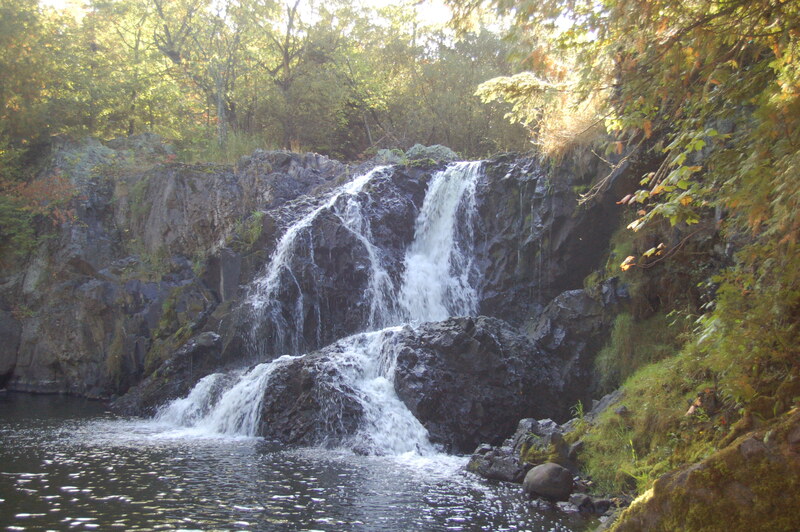 A 2007 U.S. Geological Survey report officially named Interstate Falls as the larger and more scenic drop. 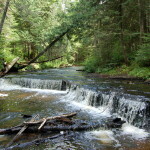 You can learn more about other Northwoods Land Trust properties at http://northwoodslandtrust.org/siteFiles/conserved-lands/nwlt-owned-properties/. 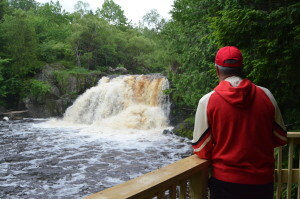 We thank them for giving Michigan residents and visitors a way to see this fantastic waterfall!